Sometimes I need to resolve Maven dependencies programmatically. 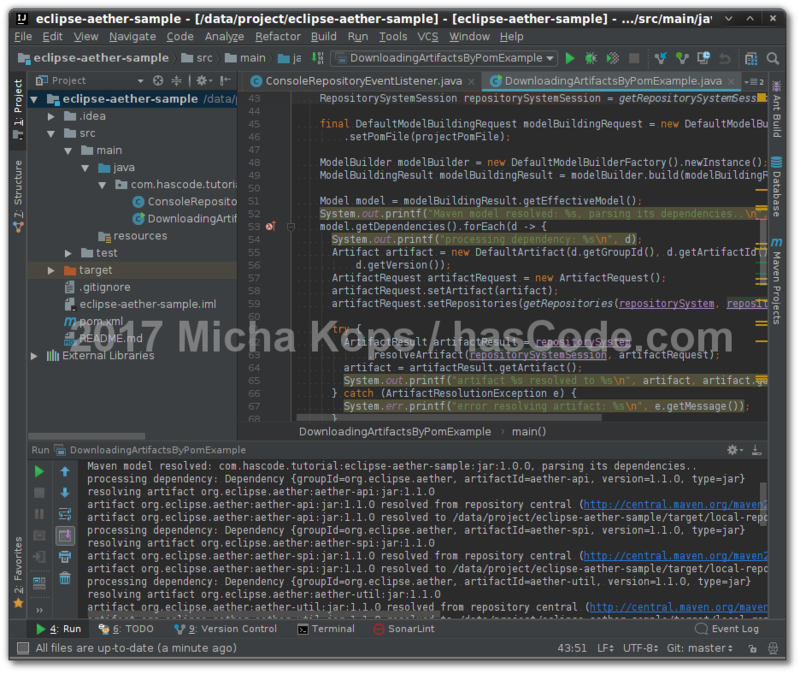 Eclipse Aether is a library for working with artifact repositories and I’ll be using it in the following example to read dependency trees from a given POM descriptor file and download each dependency from a remote Maven repository to a local directory. Maven model resolved: com.hascode.tutorial:eclipse-aether-sample:jar:1.0.0, parsing its dependencies.. This entry was posted on Friday, September 8th, 2017 at 8:12 am	and is filed under Java. You can follow any responses to this entry through the RSS 2.0 feed. You can skip to the end and leave a response. Pinging is currently not allowed. Alternatively, you can use Shrinkwrap Resolver, which makes it really simple. Which artifact do I need to add to get a reference to the “Maven” class in your example? Thanks for your examples for downloading artifacts from the maven repository. Do you have any example to upload artifacts to the repositories. you could possibly use the DefaultModelResolver but I thought that this one would be used anyway if nothing else is specified (like the tutorial’s examples). Please post an update if it worked for you or provide your pom.xml file that produces the error so I can try to reproduce the problem.